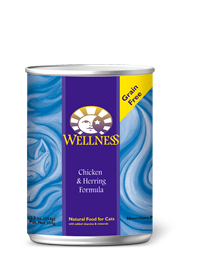 Chicken Broth, Chicken, Chicken Liver, Crab, Herring, Egg Whites, Oat Fiber, Carrots, Sweet Potatoes, Natural Flavor, Guar Gum, Potassium Chloride, Tricalcium Phosphate, Squash, Blueberries, Cranberries, Zucchini, Flaxseed, Sodium Carbonate, DL-Methionine, Taurine, Sodium Phosphate, Iron Proteinate, Beta-Carotene, Zinc Proteinate, Vitamin E Supplement, Choline Chloride, Cobalt Proteinate, Thiamine Mononitrate, Copper Proteinate, Folic Acid, Manganese Proteinate, Niacin, d-Calcium Pantothenate, Sodium Selenite, Vitamin D-3 Supplement, Pyridoxine Hydrochloride, Riboflavin Supplement, Vitamin A Supplement, Vitamin B-12 Supplement, Potassium Iodide, Biotin. 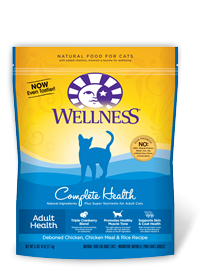 This food contains 826 kcal/kg or 70 kcal/pouch ME (metabolizable energy) on an as fed basis (calculated). 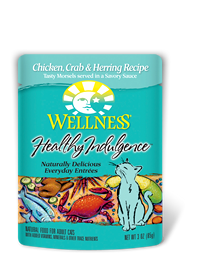 Wellness® Healthy Indulgence® Chicken, Crab & Herring Recipe Cat Food is formulated to meet the nutritional levels established by the AAFCO Cat Food Nutrient Profiles for maintenance.